First off, my transmitter set-up looks to be outmoded, I have a JRX347, which of course is 35Mghz, on firing it up I discovered that it is not responding with control surfaces juddering and no answer to my control commands. I therefore intend to replace this, probably with a Hitec Flash7 combo as I have a fair few Hitec and JR micro servos that I'm guessing I could still utilise. Another option, in light of Hitec abandoning Tx upgrades would be FrSky Tarans Q X7 although the set-up and programmming looks a little daunting. To summarise, it seems I need to upgrade my radio gear, replace obsolete NiCad's with newer battery technology and acquire a suitable charger for these (would prefer an AC/DC dual charger). I'm hoping I can utilise my existing ESC's and servos so advice on which is the best way forward along with kit recommendations would be greatly appreciated. Stephen, yes you can use all your existing servos and ESCs with 2.4 receivers with any modern brand, so no issues with using Frsky receivers, just note with Frsky that they have a couple of transmission protocols, one with is EU compliant and one used in the US and other places, if you buy all you kit from EU suppliers then no issue, if you say buy receivers from Hong Kong then they may come with the "wrong" firmware, you can change it but something to be aware of. Lots of good chargers out there, I'm using a couple from Overlander that I am very pleased with. I seem to remember that they had a Lithium internal battery on the PCB, that lasted about 5 years ? Frank, Point noted on not going overboard on the voltage - I may have been tempted! Good to know I can use my existing ESC's, what would be the minimum voltage for the LiPo batteries and would a 2000mAh LiPo give me the same flight time as a 2000mAh NiCd? Denis, yes I read about the lithium battery but as I am still getting a readout on the screen and can scroll through the functions I assumed it was still ok. I've seen a tutorial for changing the lithium battery but it looked quite involved and the fact it's going to go at some point steered me towards replacing the whole thing. Shame really as I liked the 347, do the symptoms I'm experiencing indicate any particular problem or do I just assume it's goosed and give up on it? Re your JR X347 . If its OK after a battey Change including the lithium button cell in the PCB, then it can be converted to 2.4 by replacing the module with an FrSky module . Siply replaces the old module . Available from Rapid RC and RC Life cost about £35 . Re the 347. Didn't that model of Tx require the sticks to be calibrated if the main battery was left to discharge completely? The calibration method was detailed in the manual and was very easy to do. The pc board lithium button cell retained all settings including calibration. It's worth a call to Mike Ridley at Model Radio Workshop (07708 0436163). If he can't help, nobody can! The 4in1 module works with just about any receiver rather than restricting you to a single protocol. I use the JP4in1, which works perfectly with Frsky and DSM2/DSMX receivers, including the Orange R610 V2 that only costs £4.50! If the resting volts drop below 3.0v per cell it's effectively flat, the volts under load will depend on the current being drawn, you can buy battery checkers which tell you the % capacity left as the lipo resting voltage is directly releated to the remaining capacity. So if you are not using onboard telemetry readings then it's best not to fly to less than 30% capacity. Yes you should get longer from a Lipo for two reasons, firstly they are lighter and 2nd they hold their voltage better under load, so in both instances this means you'll be flying at a lower throttle setting or climbing to height much quicker, of course if you fly at 100% throttle all the time then this doesn't apply. Well I've had another tinker with the 347 and can't get anything out of it, when I switch the Rx battery on I get the usual servo noise but the Tx won't move anything. My Rx battery checker tells me power isn't an issue. JRMan, I've looked through the manual and cannot find any reference to re-calibration. Whilst it may be fixable by Mike Ridley, as suggested above, given the relatively low cost of new gear I can't see a repair being cost effective. So, I'm now edging towards buying a new Tx/Rx combo with in-built telemetry (so I can keep an eye on the LiPo voltage), new 2S and 3S power packs and a suitable charger. I'd like to source all of these from one supplier to simplify the logistics as I'm in Hungary. I'm considering the FrSky Taranis Q X7 with matching Rx but perhaps a bit daunted by the potential difficulty of programming it, anyone got experience of this system or can recommend alternatives? It might be worth removing and reseating the transmitter crystal in case the contacts have oxidised over the decades. I have a lot of experience as I changed over to modern systems a few months back. The Taranis uses Open Tx. It's not something that you can learn from the rather massive manual. Instead, you have to watch Youtube videos, which show you how to do each task you want, then, when you can't figure out what the guy is doing, you have to ask on forums. After some time, you figure out the basics, but it will take longer if you want to do anything complicated, like mixing, telemetry and stabilisation. If you stick with it, everything gradually falls into place until you end up with a system that's more versatile than many others. If you're not good at hooking things up to PCs and doing complicated settings, Open Tx might not be the best choice. I had the advantage of being an IT and electronics teacher for ten years. Only you can judge whether you think you have the capability. The problem is that everything is easy when you knw how, so now, basic settings look dead simple and logical to me, but there was a bit of work to get to that position. It's not just Frsky that uses Open Tx. There are more and more brands starting to use it. Have a look at the really nice Flysky Nirvana N14 that not only uses Open Tx, but it has a version of the Open Tx Companion in it, so that you can do everything through the LCD in a more user-friendly way rather than having to do it through a PC. There were a couple of teething problems that showed up on the review models, but I think they've been solved for the main production. If not, they soon will be. I'm pretty sure that my next transmitter will be one of those. I love the design and the way everything is protected. My First Taranis had two broken switches on delivery, so had to go back. Now the replacement has already had two more. That's despite it being handled carefully and always kept in its case. the switches are so fragile that they can be broken while in the protective case! Stephen, I may be just stating the obvious that you've already considered but IIRC the JR 347 has PCM & PPM capability also some JR tx's have two versions of PCM. Is it worth checking that your Tx & Rx are on matching modulation systems ? Re the Taranis - I don't think that the QX7 is the best choice for electric gliders as it doesn't have any sliders. Operating spoilers/spoilerons or flaps would have to be done using either a switch or rotary knob. OTOH the Taranis X9D does have sliders, which means any of these landing aids can be operated with both hands still on the sticks. My first dedicated 2.4GHz Tx was a Taranis X9D which was from the first batch to be imported into the UK. It followed on from 35MHz Futaba FF7, FF8 & a Multiplex Cockpit SX that I converted to 2.4 MHz using FrSky module. Although I have chosen to upgrade the Taranis in various ways using genuine FrSky parts which have always been very reasonably priced I have never suffered a failure of any switch or other item. IMO the programming difficulties have been overstated, in fact I find it easier than any of the other 3 Tx's I've mentioned. You aren't restricted to openTx on most FrSky radios (and some others as well), you also have the option of ersky9x firmware. As an example, here is the menu index display (from a FrSky QX7) you get when editing a model. The menus are, in my opinion, easier to follow and find settings than in openTx. BTW PatMc, my QX7 does have a slider. I added one, and used one of the coloured LED outputs for the switch as the extra analog input. A slider is far more use than three colours for the power switch LED. ..... I'm considering the FrSky Taranis Q X7 with matching Rx but perhaps a bit daunted by the potential difficulty of programming it, anyone got experience of this system or can recommend alternatives? ..... IMO the programming difficulties have been overstated, in fact I find it easier than any of the other 3 Tx's I've mentioned. I agree about the proramming of OpenTX: I find it much easier than the pre-programmed options in my Futaba, for I only need to know what I want each individual channel to do in response to individual stick inputs, rather than having to figure if 'ailevators' or 'elevons' or something else is the mix I'm looking for. I must admit I haven't really got my head around programming on the Tx screen, but connecting to a PC and using OpenTX Companion makes the process a real doddle. One feature I find a real boon is the ability (as with some other brands these days) to add customised voice announcements to the switches so that before a flight a quick flick of the switches will remind me what each one does for that particular model. PatMc, stating the obvious is a good thing as I may well have missed something very obvious! The screen on my Tx tells me I am running in "C" mode, I assume my receivers are the same, how do I check - is it marked on them? I've had a look at some videos and written guides for the OpenTx software and I thought it was very logical and something I'd feel happy getting to grips with, as much as I liked my 347 I always found getting about the menu clunky so I'm happy to run with it. I gather that the programming can be done through the Tx or via a computer with the computer option (Mac in my case) apparently quicker and simpler, as Allan corroborates above. Very good point on the lack of sliders, I think that rules out the QX7 (not wishing to do any DIY moods) as I would want the option to incorporate flaps/spoilerons/CROW braking. As always with these things the more one learns the more the desirable options moves the budget inexorably upwards. I'd set a self imposed budget of under £150 for a Tx/Rx combo with a minimum 7 channels and telemetry, it now looks like that's under pressure! If you're looking at FrSky, I think the standard X9D is the one to go for. It has all the switches, sliders, and knobs you'll need, and can handle 16 channels with the appropriate receiver. ...so it appears your Tx is on PCM mode. 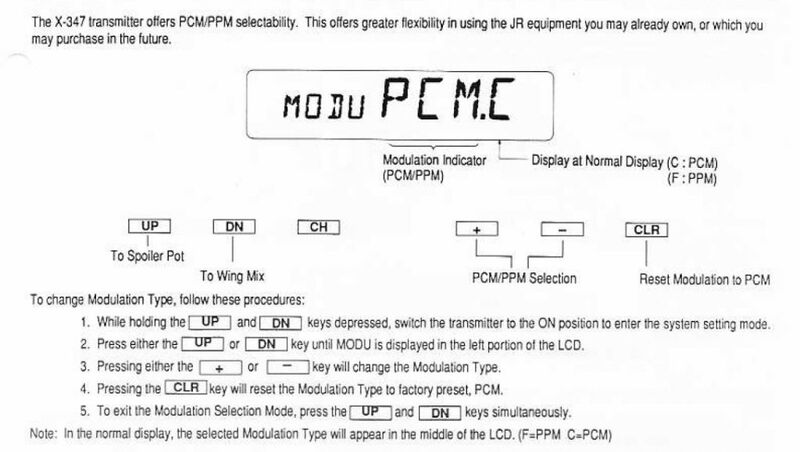 I'd guess that any PCM Rx will have "PCM" clearly marked on it but even if it hasn't you have nothing to lose by changing the Tx mode to PPM & trying that. If there's still a problem check if the Rx is "dual conversion" or "single conversion" & that it has the correct type of Xtl fitted. Well I finally bit the bullet! After what seemed an age trawling the internet I finally settled on HobbyKing as a one-stop shop for everything I needed and have ordered a Taranis X9D Tx/Rx combo, some 2S and 3S LiPo packs and an AC/DC charger. All for £270 so cannot really complain as it should be enough to re-launch my flying "career". Could be up to 10 days before it arrives so I have some time to explore the OpenTx software and maybe advance the build on my part finished "Match". Thanks for all the help in nudging me towards what will hopefully prove to be the right decision.